From April 29 to May 3, 2016, 11 students of the Major Seminary of the Congregation of Marian Fathers in Lublin, together with their Rector, Fr. Tomasz Nowaczek, MIC, celebrated their retreat in our convent in Grąblin. The time was devoted to learning, prayers, and Adoration before the Blessed Sacrament in which each retreatant met the One who has called him. Right from the start, the seminarians’ stay was marked by a warm fraternal climate, which culminated in joint recreation. Outbursts of joyous laughter did not impede serious discussions about our common spiritual sources and specific charisms, which are complementary. The brothers rely on our monastic prayer support, while we rejoice in their apostolic ministry in the Church. “Consider, therefore, whether you’re of one heart and one spirit with the others” — Saint Stanislaus of Jesus and Mary Papczyński. “Let the sisters have one heart and one soul, and then the Holy Spirit will dwell in the sisters” — St. Jeanne de Valois. In front of the Mother who is our Model, we gathered at the church main altar, under the bas-relief of the Blessed Virgin surrounded by her Evangelical Virtues. In his homily on the Solemnity of Mary, Queen of Poland, Fr. Tomasz encouraged all to gaze at the Immaculate. She is the one who teaches how to keep perfect vigil and love Christ, who is the goal of our life. “In Mary, as in a mirror, are reflected the grace of purity and beauty of virtue” — Saint Stanislaus of Jesus and Mary Papczyński. “It is expedient first and above all else to keep the Virgin herself constantly before the eyes, directing your thoughts and your gaze upon her, as the Astrologers gazed upon the Star” — from the Preface to the Rule of the Ten Virtues of the Blessed Virgin Mary. We lived out together some powerful times of prayer at the church. We prayed Matins, the daytime prayers, and Vespers. As we prayed the Divine Office, we created one community, making sure that we sang in unison. 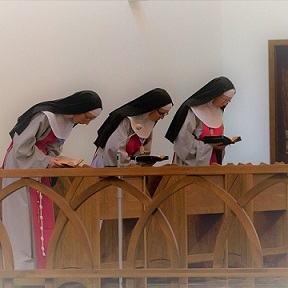 Despite the lower range of their voices, the Marians were able to adjust themselves to different melodies in our liturgy, which brought fruit in the form of beautiful singing to the glory of the Most High. We expressed our joint joy and gratitude to God for the gift of our religious vocations. Naturally, the Eucharist and Adoration of the Blessed Sacrament were the highlight of each day. The seminarians served at the altar with great reverence and concentration. One of them beautifully played on the organ. “Come, then, come down to your home as soon as possible to welcome the Heavenly Visitor there. May He be pleased with your hospitality!” — Saint Stanislaus of Jesus and Mary Papczyński. “Happy is the one who can say with heart, mouth, and deeds: Jesus, my Love! Jesus, my Spouse! Jesus my God and my All!” — The Rule of the Ten Virtues of the Blessed Virgin Mary, Chapter I. We thank God for this meeting with the Marian seminarians and priests, and we embrace them with our prayers, commending each one to the care of Our Lady of Licheń! Magnificat!